Each day I strive to live as though I am the embodiment of my parents Ephraim & Mavis. They were caring nurturers providing us with a balance of the qualities that they themselves were made of . Their luminous smile radiated peace and joy in everyone in their proximity. In our beloved parents were united admirable qualities and quaint contradictions: they were righteous and reverent, but soft-hearted and compassionate; stoic and formidable, but comforting and protective of their own. For these reasons, and many more, we decided to endow a foundation under their name. This foundation truly defines the innate beauty of both our parents and provides a channel for education and health care for those who deserve it most. We will remember them as they were- vibrant, dynamic and compassionate with inner beauty that death cannot erase from our memories. I am truly delighted to be associated with such a noble institution; one that is making a difference in the lives of so many persons. I must commend the Founders and Executives of Golden Krust for initiating this move and for the display of unselfishness in giving back to the community. The establishment of the Foundation is a most befitting manner to honor the memory and bring to fruition the dreams of Mavis and Ephraim Hawthorne. As a member of the Golden Krust Foundation, I want to be an intricate part of addressing the issues of Healthcare that affect our community. I believe that through the Foundation, we can close the gap of Racial disparity that so many in our community face. Also, I look forward to working with the other members of the Board. I am proud to be a member of the Foundation and accept the challenge of making a difference. 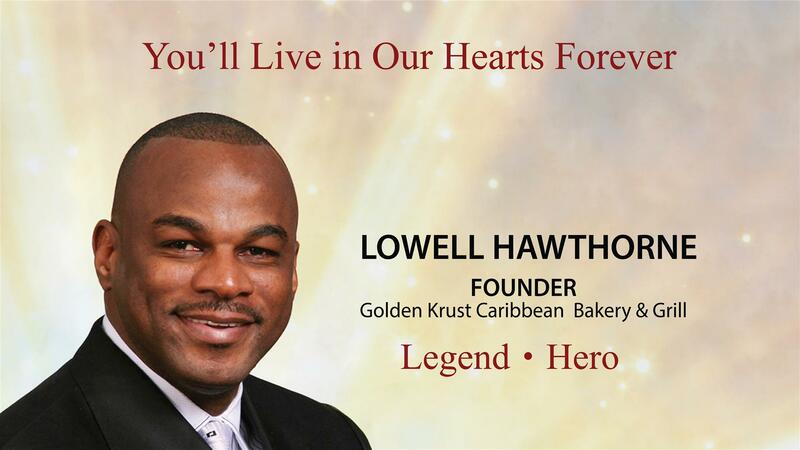 As a member of the Board of the Mavis & Ephraim Hawthorne Golden Krust Foundation, Inc, I would like to say congratulations on this special occasion and best wishes for continued success. I feel privileged to be involved with this organization and look forward to accomplishing the goals we have set. Quality education, healthcare and nutrition are three essential mission/goals of the Mavis and Ephraim Hawthorne Foundation. As a physician and parent, these goals are extremely important to me. I am very excited about the far reaching prospects of this foundation in our Caribbean community. This organization seeks to improve the lives of children and fellow citizens by empowering them through funds for education and strengthening them by directly providing quality healthcare and nutrition. I am dedicated to this Foundation and it´s mission. My grandparent’s strong belief in education was one of the factors that lead me to pursue a career as an ed- ucator. | see first hand how an education opens doors and brings dreams to fruition. This foundation acts as a vehicle for that to occur. I am truly proud to be a part of that. The opportunity to give back to my com- munity, foster ideals in deserving students, and cement my grandparent’s legacy through this foundations scholarships, is what drives me to be a board member and an active participant in this organization.